If you are one of my Twitter followers, you know how passionate I am about Detroit. I've been on a new adventure in life and learning more about our environment, tar sands, pipelines and the list goes on. On this new journey I have had the pleasure of meeting new people and groups. One group in particular is called DCATS and I've invested a few weeks learning about what they do. Today July 24th, 2013 I have become a member of this great group of people. All opinions expressed will be mine as I will never speak on behalf of this group unless otherwise noted. I can NOT express how honored I feel to be part of such an amazing team of people. 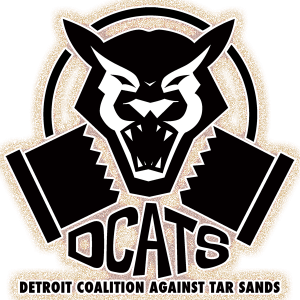 DCATS is a Detroit collective of concerned individuals and organizations whom are uniting in efforts toward the elimination and removal of tar sands petroleum refinement. This is the Detroit branch of MiCATS – Michigan Coalition Against Tar Sands. Build a diverse and inclusive coalition of people in Detroit committed to building local power and spreading awareness about the destructive nature of tar sands while co-creating a vision for clean energy alternatives as part of the larger movement rising to stop the extraction, refinement, and transportation of tar sands across North America.